Media captionTheresa May: "If we want to get on with leaving, we need to start this process soon." Theresa May has told MPs it remains her "priority" to deliver Brexit, defending the decision to delay the UK's exit from the EU. The prime minister promised to pursue an "orderly" Brexit, adding that the "whole country" was "frustrated". 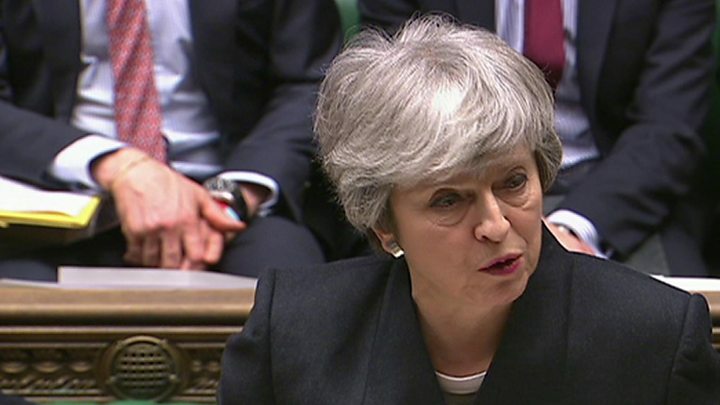 The government said on Thursday it would "continue to make all necessary preparations" for a no-deal Brexit, after it was reported that departments had stood down their planning. A government source said "plans will evolve and adapt" but would not stop, while the chance of leaving the EU without an agreement remained. The source added that a leaked message referring to the "winding down" of no deal preparation related only to Operation Yellowhammer, the contingency planning operation based on worst-case scenarios - and not no-deal planning in general. She said: "The whole country is intensely frustrated that this process of leaving the European Union has not been completed." On the latest delay, she said: "The choices we face are stark and the timetable is clear. I believe we must now press on at pace with our efforts to reach a consensus on a deal that is in the national interest." And she told MPs that the UK would hold full EU membership rights during the extension, saying the country "would continue to be bound by all our ongoing obligations as a member state, including the duty of sincere co-operation". Mrs May and Mr Corbyn had a "short meeting" on Thursday, Labour said. Media captionJeremy Corbyn says the Article 50 delay is a "diplomatic failure"
In Parliament, Mrs May said: "Reaching an agreement will not be easy, because to be successful it will require both sides to make compromises. 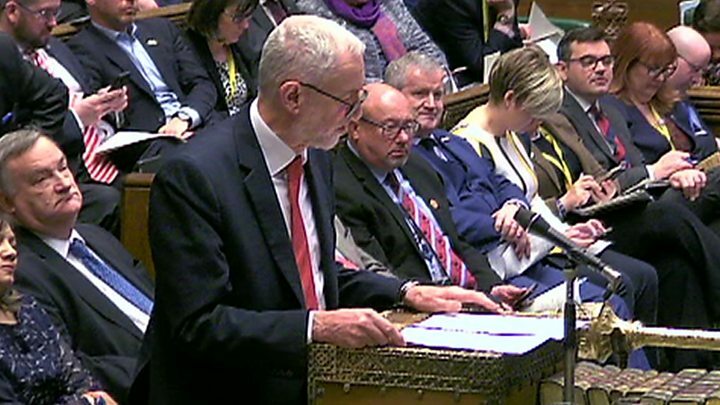 In response, Mr Corbyn said: "The second extension in the space of a fortnight represents not only a diplomatic failure but is another milestone in the government's mishandling of the entire Brexit process." He added: "The prime minister has stuck rigidly to a flawed plan and now the clock has run down, leaving Britain in limbo and adding to the deep uncertainty of business, workers and people all across this country." Mr Corbyn said cross-party talks were "serious, detailed and ongoing", but warned that the government would "have to compromise". If no agreement was possible, he said: "We believe all options should remain on the table, including the option of a public vote." Ian Blackford, the SNP's Westminster leader, urged Mrs May to use the extra time to hold a second EU referendum. Media captionAfter Bill Cash calls on her to resign, Theresa May replies: "I think you know the answer to that." "It's now a very real possibility that we can remain in the European Union," he said. "As of today, there are 204 days until the new Brexit deadline on the 31 October, so will the prime minister now remove the ridiculous excuse that there isn't enough time to hold a second referendum with remain on the ballot paper?" 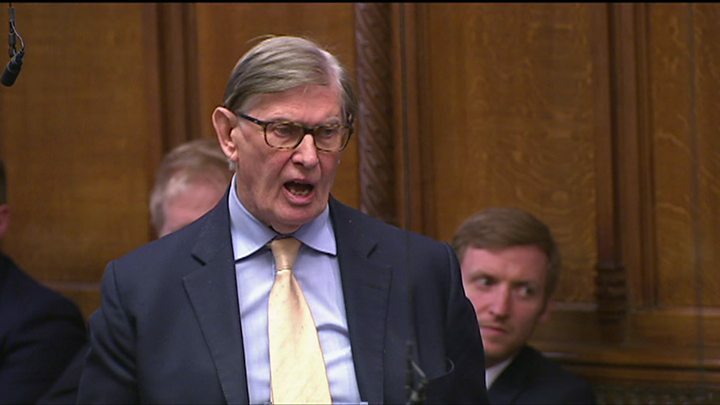 And Brexiteer Conservative MP Sir Bill Cash accused the prime minister of "abject surrender" to the EU in allowing the delay and said she should resign. Before the Brussels summit, Mrs May had told leaders she wanted to move the UK's exit date from this Friday to 30 June, with the option of leaving earlier if Parliament ratified her agreement. European Council President Donald Tusk said future developments were "entirely in the UK's hands", adding: "They can still ratify the withdrawal agreement, in which case the extension can be terminated." Mr Tusk said the UK could also rethink its strategy or choose to "cancel Brexit altogether", but urged: "Please do not waste this time."